"How to Examine and Treat Swelling..."
Medically speaking, what exactly is a swelling? A swelling (a localized increase in size) may occur anywhere on the body or deeper within any internal organ or structure. A superficial swelling can be readily assessed by following the basic principles of examination. A deeper swelling will, in addition to a thorough physical examination also require specific special imaging techniques e.g. a CAT scan, a MRI scan or an ultrasound scan. A cyst is a bag-like structure lined by a membrane and filled with fluid or a semi-fluid material. An abscess is a localized cavity filled with puss. A hematoma is a localized cavity occupied by a blood clot. By the way, local or localized means that the swelling is not systemic, in other words it doesn’t affect the whole body. Many patients when they notice a swelling somewhere on their body fear the possibility that it may be cancerous in nature. So it is important when examining a swelling to be very reassuring and consider the psychological and emotional needs of such a patient. All body swellings should be properly and meticulously investigated because of the potential of it being cancerous in nature! A patient with a swelling on their body (real or imaginary). The necessary instruments are included in The Apprentice Doctor set. Ascertain the main complaint (medical term: the presenting problem), and take a medical history (see project 0). Wash your hands, put on gloves. Determine the location of the lesion and briefly examine it by inspection. The history and course (progress) of the swelling and the duration (hours/days/months/years) Does it relate in any way to previous medical treatment or injury? Pain (character e.g. throbbing/gnawing, the level e.g. mild/moderate/severe, frequency e.g. constant/occasional). Perform a detailed examination of the lesion by inspection (use the magnifying examination light for this purpose) and palpation (as well as percussion and auscultation if indicated). Describe the lesion and make detailed notes on your findings in your medical file (included in the kit). Comment about the location, dimensions (exact size), color and consistency (e.g. soft/spongy/rubbery/bony hard etc.). Describe the edges – comment on the movement of the swelling over other structures (e.g. muscle and bone) as well as the movement of the overlying skin over the swelling. Is the swelling warmer than the surrounding tissue; is it tender to touch and pressure? Examine the draining lymph nodes (see Project 32 -The body’s lymph nodes). Make similar comments about the lymph nodes as described in Step 5 above. Judging the swelling by its characteristics, do you think it is an inflammatory swelling, a benign growth, a cyst or does it appear to be a cancerous growth? A thorough knowledge of pathology (the branch of medical science that studies the cause, nature and effects of diseases) is required to answer the previous question effectively. Fluctuation can be tested by placing the index and middle finger of the one hand (somewhat apart) on the swelling, with the index finger of the other hand placed in between these two fingers. Alternate downwards pressure over the lesion with these fingers. Fluctuation occurs when the finger of the one hand is forced upwards when pushing downwards with the fingers of the other hand. Use a balloon partially filled up with water to practice this technique. The localized retention of fluid in a part of the body may cause swelling. This is called edema (see Project 45). A cancerous swelling is often pain free and not tender until in fairly advanced stages. That’s why it’s so dangerous. The patient doesn’t know anything is wrong until the cancer has advanced. The earlier a growth is diagnosed the better the chances of successfully fixing the problem. Both a cyst and an abscess manifest the sign of fluctuation on clinical examination.An abscess is usually excruciatingly sore while an uninfected cyst would normally not be tender to palpation. The basic treatment of an abscess is “incision and drainage” as well as elimination of the cause.Antibiotics and painkillers merely play a supportive role in the management of an abscess. Benign tumors and cysts are usually managed by surgical removal (medical term: excision). chemotherapy (medication that is selectively toxic to cancerous cells). Cancerous growths all have the inert ability to metastasize (to spread to distant sites in the body via the lymph ducts and/or the vascular channels (arteries and veins). A good number of swellings, especially if mismanaged, may develop into a serious threat to a patient’s health, and may eventually become life threatening! This project has given you a glimpse into what you can expect from The Apprentice Doctor Foundation Course & Kit. Purchase a kit for yourself if you’re a student, or if you’re a parent why not purchase one for your son or daughter. 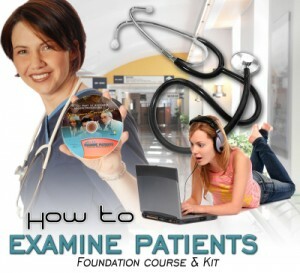 The interactive CD-ROM contains over 45 projects just like this, with added features such as pictures, detailed video explanations, sound clips to explain the topic more completely, not to mention the medical instruments, such as a real stethoscope, thermometer, otoscope, masks, swabs etc. are included in the package.